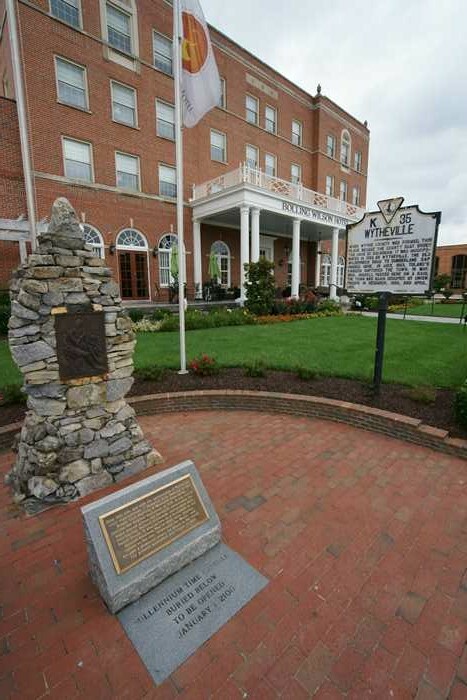 Wytheville, Virginia is a small town that plays a big role in western Virginia. It’s the crossroads of two major Interstates and a couple of US highways, and it’s the biggest town you’ll find for miles around, which makes it a great place to stop and get a meal or spend the night. It also has a nice little downtown district with a few unique features — including a really big pencil. A walk around town provides a nice break from whatever road you’re traveling. Wytheville, Virginia is located at the western junction of Interstates 77 and 81. You can access downtown via exits 73 or 70. Follow US 11 or US 21 into the center of town. My vacation was almost over, but instead of heading back towards Pittsburgh, I headed south, out of West Virginia, to spend my next-to-last night in Wytheville. I added this detour in my trip, in order to visit the giant Labor Day weekend flea market in Hillsville, Virginia — which is just about a half-hour’s drive further south on Interstate 77. After arriving and checking into my hotel, I had a few hours before dark, so I took a walk around town. 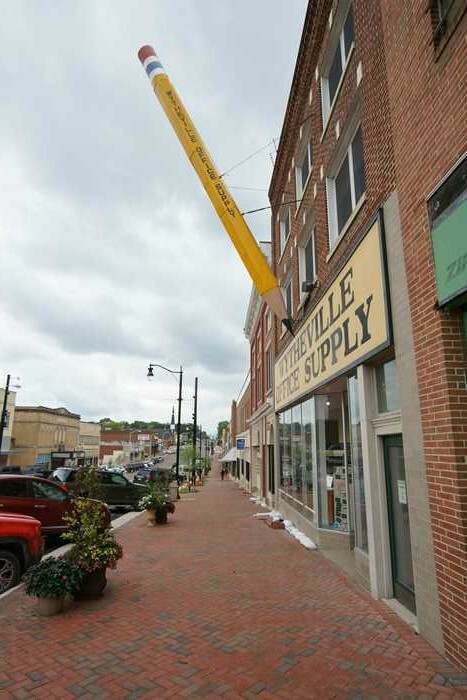 I’m guessing downtown Wytheville’s most famous feature is the giant, two-story-tall pencil that looms over Main Street. I’ve read that you can also see a giant pair of scissors if you step inside Wytheville Office Supply. And, some visitors have reported receiving some free souvenirs, just for stopping in and expressing their love for the big pencil. Unfortunately, I didn’t know this at the time of my visit, so I can’t confirm it. But I’ll definitely stop in next time. Walk a short distance down Main Street, and you’ll also find an oversized can of paint, tipped and ready to spill onto the sidewalk. It would probably be more famous if the big pencil didn’t steal all the glory. 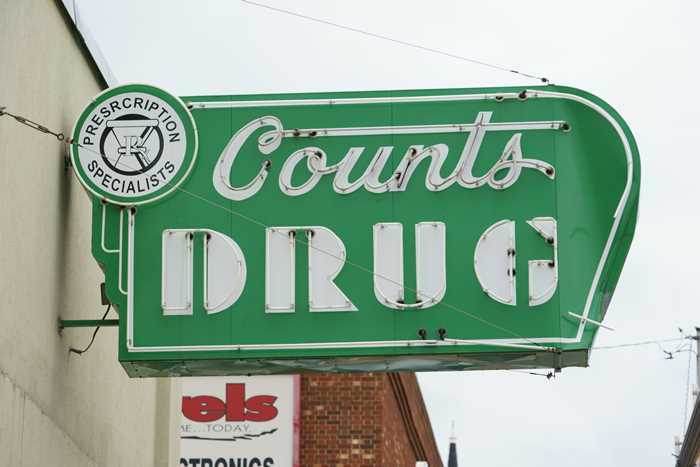 Counts Drug also has a couple of nice neon signs (there’s a second one around the corner). 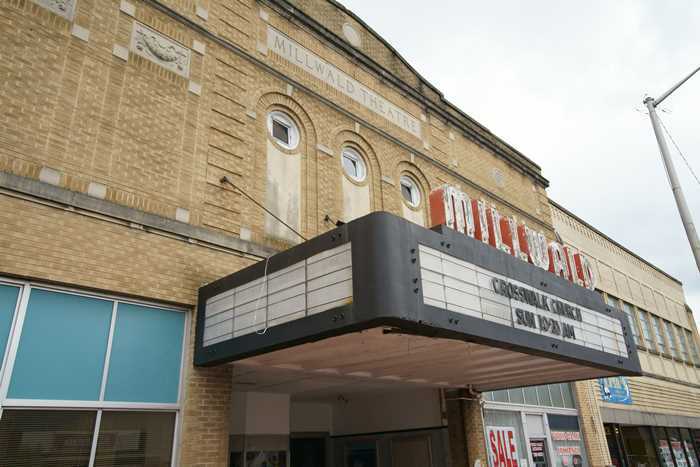 The old Millwald Theater dates back to 1928. It appears it is now being used as a church. The Bolling Wilson Hotel is a year older than the Millwald. It has been remodeled and still functions as a boutique hotel. “Bolling Wilson” refers to Edith Bolling Wilson, the wife of President Woodrow Wilson. Wytheville was her birthplace, and there’s a museum dedicated to her, across the street from the hotel. In front of the hotel, take special note of the metal plaque on that stone monument. It’s one of about 60 remaining plaques for the Boone Trail Highway. Hundreds of these plaques were once placed across America, some of them along the former paths of Daniel Boone. Many of those plaques have now been lost, but you can still see this one in Wytheville, Virginia. 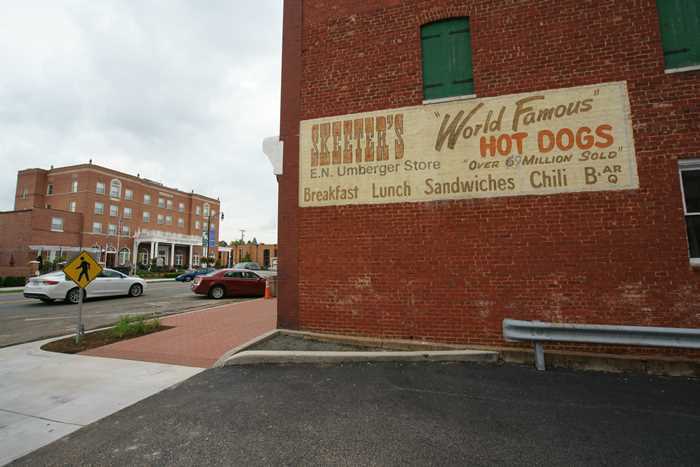 There are also, apparently, some “world famous” hot dogs at Skeeter’s in downtown Wytheville. 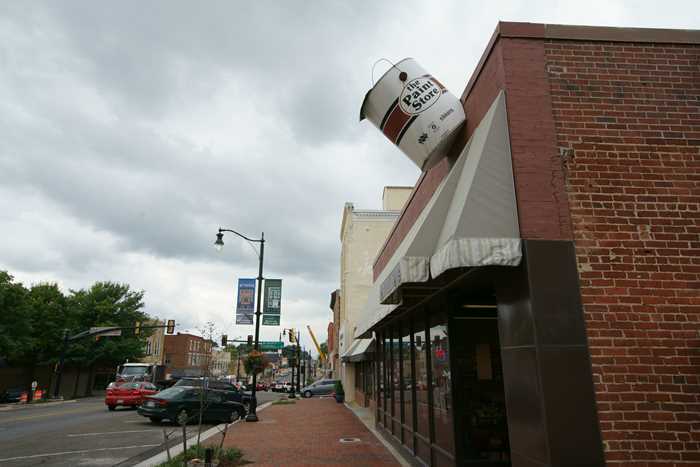 But, without a giant hot dog dangling over the street, it’s hard to be convinced. With some more time to spend before dark, I tried to decide where to go next. My options were limited by those low-hanging clouds over town, but I chose to ignore them and take a short scenic drive up Big Walker Mountain, north of Wytheville. Wytheville’s downtown is interesting, and well worth a few minutes of exploration — even if the only thing you stop to see is the big pencil.